A thrilling Australian adventure story that asks: whose stories matter when you're making history? Some tour dates are already planned for 2019 and 2020, so if the dates match up, this would reduce remount costs for presenters wishing to book Air Race. 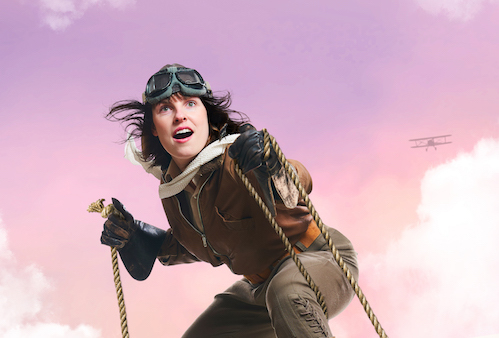 Inspired by the true story of the 1919 London to Australia Air Race, this new Australian work by Arena Theatre Company, follows the seven teams who took to the skies in a thrilling race to victory, chasing an adventure that would take them half way across the planet. From crash landings to disappearing planes, their stories range from harebrained and hilarious to deeply moving and sometimes tragic. Their incredible resourcefulness and unstoppable determination prove nothing is impossible. Written by award-winning playwright Dan Giovannoni, designed and directed by Arena Artistic Director, Christian Leavesley, with lighting design by Paul Jackson, Air Race is visually and conceptually breathtaking. Within the dynamic beauty of the performers flying on their moving flying apparatus, whilst playing instruments and singing their haunting ballads, Air Race gives us a glimpse into what it means to tell historical Australian stories in a way that gives them meaning for a diverse new generation of Australians, asking the question "Doesn't the sky belong to all of us?" Air Race is specially crafted to inspire young people aged 8+ and their families. Original music, performed live, whilst balancing on moving set pieces. Inspired by a true story from Australian history. 1919 is the 100 year anniversary of the original Air Race. Local flying clubs really engaged with the show and helped us in selling the show to their members. Dynamic, daring and exciting use of the moving set pieces to create the feeling of flying through the air. Arena has an established relationship with the Australian Women Pilots Association, which has chapters in many cities and can be called upon to promote the show to their members. This work will be of particular interest to primary schools and high schools who are interested in promoting diversity. Schools with a high population of first generation Australians will be very interested in the work and the concepts it explores. As such, it should be marketed towards both upper primary and high schools, but also to families. It is aimed at ages 8+. Arena are experts at running engaging creative workshops for primary school aged students. Our workshops use technology and creative processes to help children explore ideas and themes from the show. Being based in regional Victoria, we can head to your town to run a workshop up to 4 weeks before the tour arrives, and in this way we can drum up interest for the show in the lead up.